KATIE: Waffles, you're supposed to wrap the drumsticks, not eat them. WAFFLES: Wrap them? How am I supposed to wrap them? I'm busy. KATIE: Maybe if you stop eating and start wrapping??? WAFFLES: But what about quality control and stuff? CALI: So where's all the drumsticks? CRAWDAD: Employee #709857 is clearly not working out. BELL: You mean that orange Waffles-something cat? CRAWDAD: Chicken and Waffles. A dangerous combo. BELL (middle): Sounds like a happy meal to me. WAFFLES: Did someone say Happy Meal??? 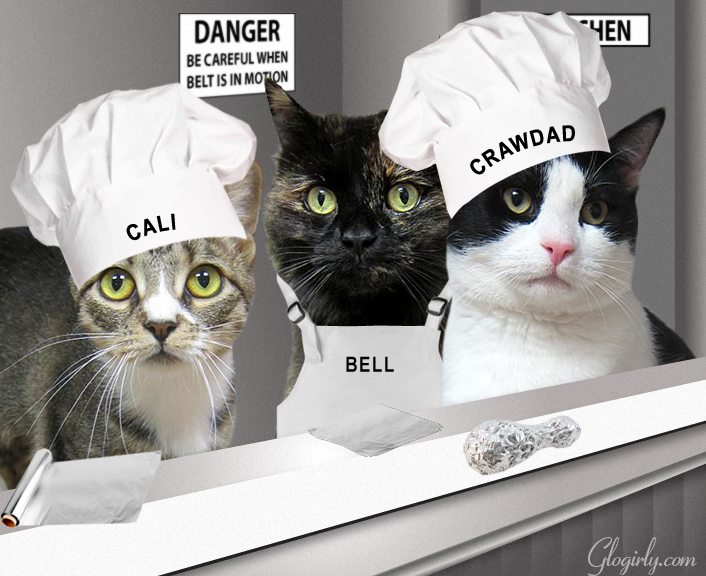 Today's Cameo Cats are Bell, Crawdad and Cali. Cali is an energetic two-year-old mom kitty that recently retired from the kitten producing biz. She's practically a kitten herself! Crawdad is a handsome tuxie, just under two years old. He's gentle, friendly and gets along with everyone. ...and he's got just about the cutest pink nose we've seen. Beautiful green-eyed Bell is a lovely four year old tortie. She's got a sweet disposition and not an ounce of tortie attitude. All three of these sweet cats are fully vetted, ready to shower you with love and available for adoption at PAWS Pet Animal Welfare Society in Norwalk, CT.
Every Saturday we feature adoptable cats from PAWS in Norwalk, CT. in our #TVTripCaturday blog series. Through the magic of Photoshop, they join Waffles and Katie for some time-travel adventures to some of our favorite, classic shows. We also introduce you to the 'Cameo Cats' and share a little bit about them. Maybe, just maybe... our crazy antics will help our shelter friends find forever homes. 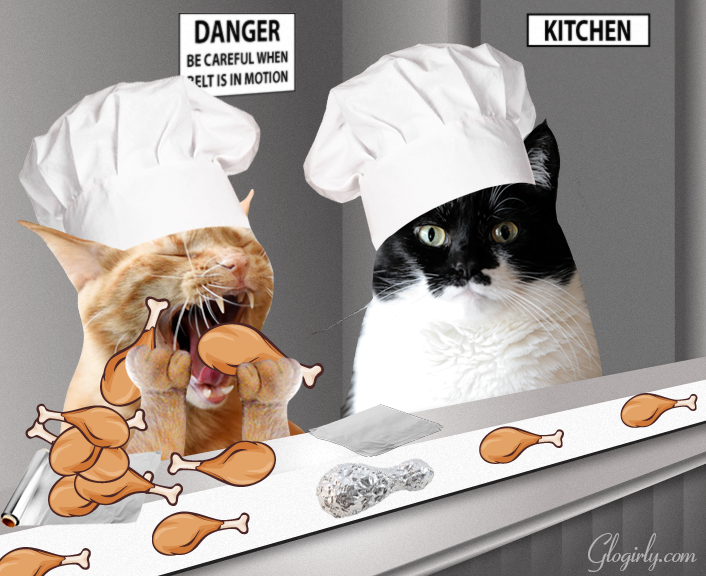 OMC, we LOVE the pic of Waffles stuffing his face with drumsticks. Priceless! Chicken and Waffles...gotta love it! I think chicken quality control would be an awesome job! MOL!!! We're surprised one drumstick got wrapped!!! We hope those sweeties find their furever homes very soon. 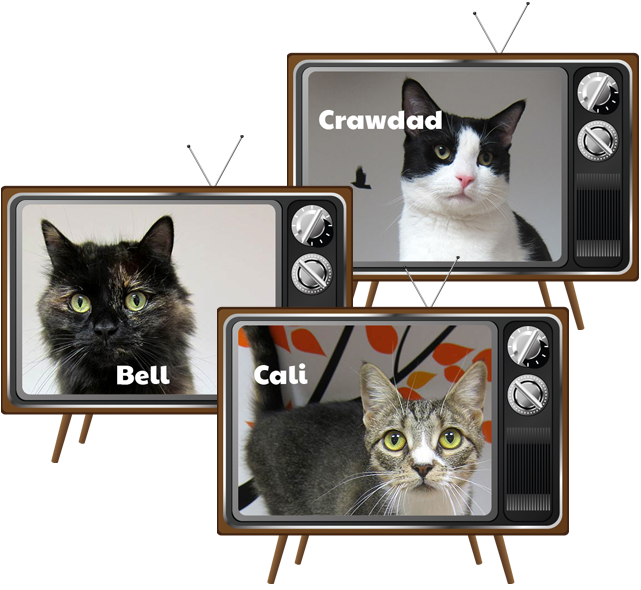 Guest stars Bell, Cali, and Crawdad are the most charming trio! I Love Waffles! Thank you for shining your spotlights on the shelter cats. Good show this week folks. You get funnier each time. M says we have to visit you when she is hungry because her sides hurt from laughing and on a full tummy it is too much! Purrfect TV scene remake for Waffles! And love the comments from the good humored QC team. 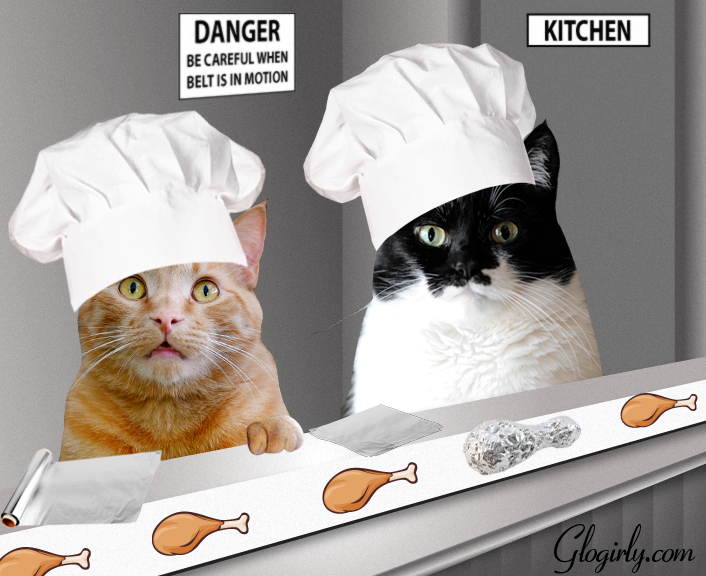 Hope it helps them each find their own furrever home ... with chicken. How did you get that job? Looks good! We would also love to be quality control tasters like Bell,Crawdad and Cali. They are sweet kitties and we purr they get good homes. OMC--love that name: Crawdad! We hope these sweeties get forever homes soon. Waffles I'm with you re quality control!! You gotta check!! MOL We saw and shared about the three kitties from Shelter Cats. Crawdad is a name to conjour with!!! We love that episode of I LOVE LUCY. Well played Waffles. I think Waffles is the wrong one for that job, even though he thinks it is perfect for him. I hope those lovely kitties find their homes. Whoa Katie..did you see that handsome tuxie mancat Crawdad...you are all beautiful kitties...Waffles...put those drumsticks down,,and I don't mean down your throat..lol..
Dat's weally cute. Yous guests awe just gawjus. Weez sure purrayin' they get homes soon. You're eating the profits, Waffles! 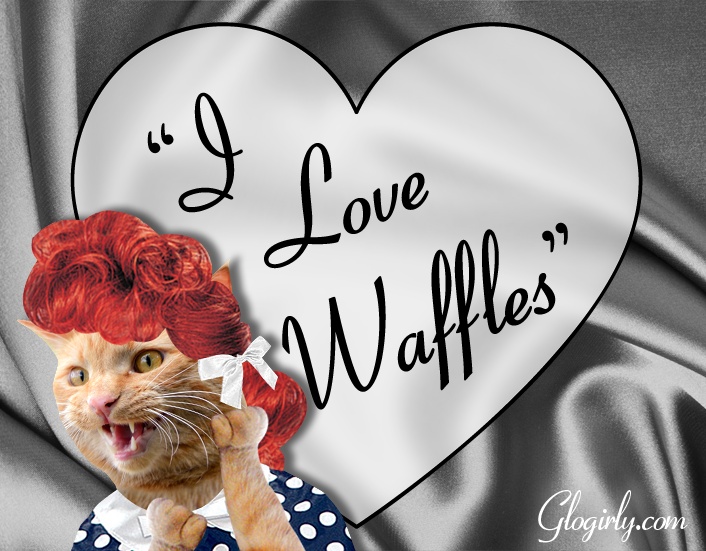 Why can I *totally* see Waffles as that zany Lucy??? Allie: Or two drumsticks shy of a -- mmmmpf! WAFF! No worries! I got yer back! Beautiful kitties- I hope they get their forever homes soon. I love this Lucy spoof. Thank you for the kind words you left for me about my Lucy on my blog. I used to always say, Lucy you got some splainin to do.